It was a memorable, inspiring and colorful time in Yokohama, Japan. We are grateful to our Japanese hosts for their outstanding hospitality and thank all of the attendees who made this a convention we will never forget! Past SIA President Cathy Standiford hangs her wish for the world's women and girls. The theme of this year’s convention was “Stars, Dreams and Wishes,” which had a symbolic relationship to the Japanese culture. Each year since 755, Japan has celebrated the reunion of Orihime, the weaver star and patron of silk farming, and Hikoboshi, the cowherd star and agricultural messenger. The Milky Way separates the lovers who can only meet once a year. In Japan, the lovers’ reunion is celebrated by Tanabata or Star Festival, every July or August. The Japanese write their hopes and wishes on long colorful strips of paper, which create beautiful displays of multi-color streamers placed upon trees. Similarly, Soroptimists in our 21 countries and territories only have the opportunity to meet face-to-face every two years. So for one week more than 2,500 Soroptimists came together to celebrate our stars, explore our dreams and make wishes for the future. The convention paid homage to another Japanese tradition as well—the haiku, a traditional form of Japanese poetry. Prior to convention, members had the opportunity to submit their own haikus. Some even received the chance to read their poems on stage, while other haikus were featured at various sessions throughout the week. Attendees also had the opportunity to dress in kimonos, learn calligraphy and partake in a traditional Japanese tea ceremony. Members don traditional dress at the Writing Our Wishes Reception. 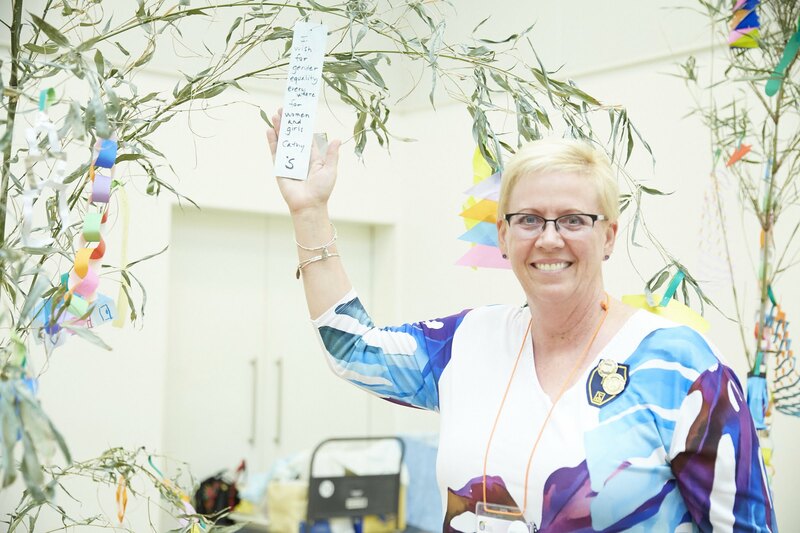 which were then hung on the Soroptimist Tanabatas trees that stood throughout convention in the exhibit hall. By the end of the week, SIA’s Tanabata trees were dressed in a rainbow of color and inspiring messages for women and girls. Soroptimist leaders—Renata Trottmann Probst, President of Soroptimist International of Europe; Sue Williams, President-elect of Soroptimist International of Great Britain & Ireland; and Anusha Santhirasthipam, President of Soroptimist International of the South West Pacific—shared greetings of friendship and goodwill from their federations. 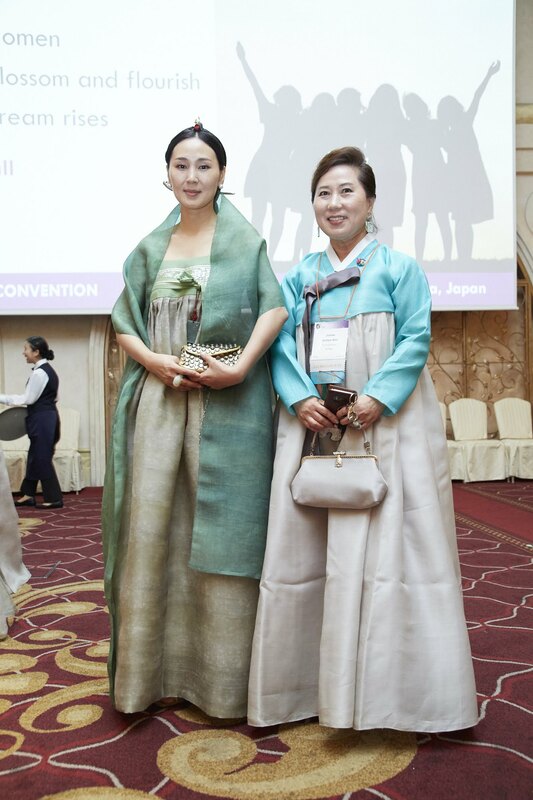 And attendees enjoyed a special performance by legendary Japanese movie, television and stage actress, Michiko Godai, who leaves of legacy of drawing attention to the many challenges that women and girls have faced throughout history. The festivities ended with live music by the Yokohama Jazz band. 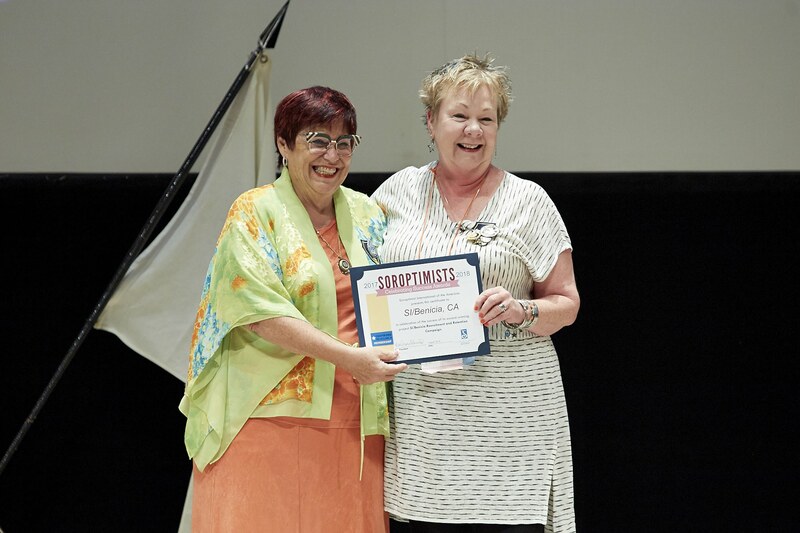 SI/Benecia, CA, accepts a Soroptimists Celebrating Success Award for excellence in Membership. presentation, while designated flag bearers placed the flags of SIA, the United States (home of our President Dawn Marie Lemonds), Japan (host country) and SI (our parent organization) on the stage. Convention had officially begun! 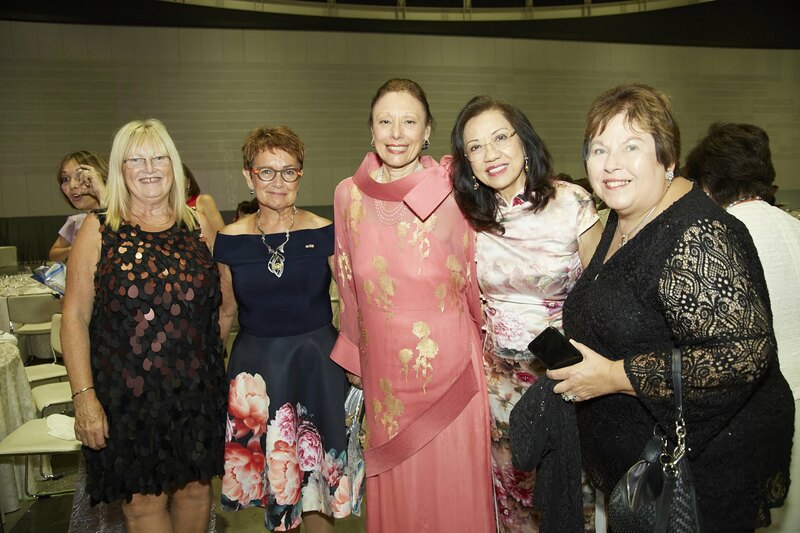 SI President Mariet Verhoef-Cohen spoke about her efforts to advocate for gender equality and the empowerment of women and girls and shared photos from her visits to many Soroptimist projects throughout the four federations. The Soroptimists Celebrating Success and Membership Awards were also presented to clubs and regions. The move from a system of mailed paper ballots, which we currently have, to one with online/electric voting. Who should vote for board members—should all clubs in good standing vote for all SIA Board members or just clubs in the candidate’s electoral area (as it currently is now)? Attendees received background info about both of these topics and delegates were encouraged to provide feedback and input on behalf their clubs. The conversation on these topics will continue and SIA will provide more info to clubs in the future. Stay tuned! 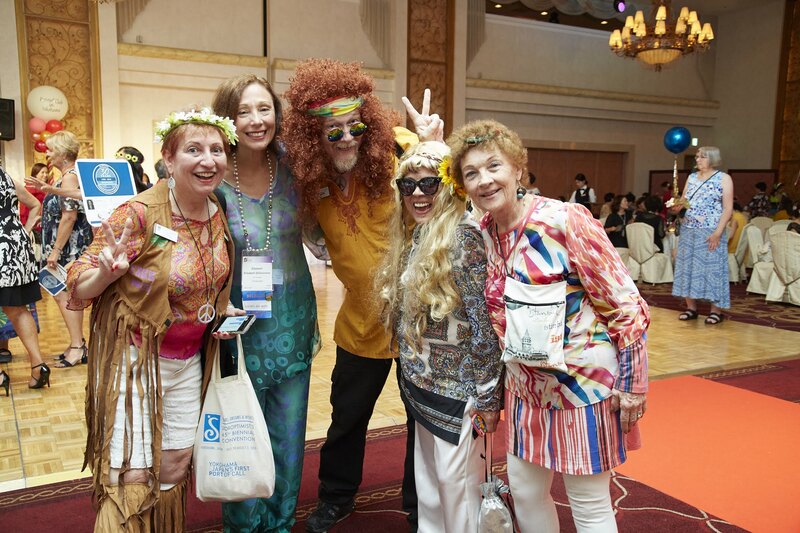 Members have a groovy time at the Laurel Society celebration. our Dream Programs. Each Laurel Society party always tops the last. This year’s soiree was themed after a 1960s era night club, based on the interesting fact that in the 1960s and 70s Yokohama was the gateway to the rest of Japan for international music and fashion. Laurel Society members donned vintage attire and enjoyed a night of music, dancing, entertainment, food and libations. This session was all about the federation—where we are and where we hope to go. It was noted that as we prepare for our second century, we need to take stock of the changing environment. We also need to increase our collective impact, become better known, attract more members and secure more financial support. Executive Director & CEO Elizabeth Lucas gave her headquarters report on the state of our organization and how we can get to the future we all envision. This informative presentation was followed by our Finance Report, delivered by SIA Secretary Treasurer Kathy King. This report shared our financial picture, including our FY16/17 financial results and our financial strategy to serve even more women and girls. Thinking about our future leads us to a presentation on our next Big Goal. As an organization we picked “Invest in the dreams of half a million women and girls through access to education” as our 2021-2031 Big Goal. More specifically we hope to empower 60,000 women and girls through the Live Your Dream Awards and empower 440,000 girls through Dream It, Be It. As SIA continues to gather member feedback to shape this goal, attendees met in small groups by language to identify strengths and opportunities to build our capacity and reach our next Big Goal. One member, Diane Thompson, has been a great strength in helping ensure that meeting our Big Goal is a possibility—for that we greatly thank Diane! A member of SI/Butler County, PA (North Atlantic Region), a past region governor and past SIA Board Member, Diane launched a matching program in North Atlantic Region at last year’s region conference, where she pledged to match up to $50,000 in donations to the Dream Programs made by her fellow North Atlantic Region members. In an effort to inspire others to give, Diane encouraged attendees to dream big, to mobilize around our organization and to support our programs. This session welcomed keynote speaker Fumiko Hayashi, Mayor of Yokohama, who provided words of wisdom, insights on global issues affecting women and girls and the magic of education in leveling the playing field. A well-respected leader—both in Japan and internationally—Mayor Hayashi has received several world-class rewards and honors, including the Wall Street Journal’s “50 Women to Watch,” Forbes magazine’s “World’s 100 Most Powerful Women,” Fortune magazine’s “50 Most Powerful Women in Business: International” and “Person of the Year” from the American Chamber of Commerce in Japan. There was much to celebrate at the Shining Stars Recognition Banquet. To our outgoing leaders: Thank you for everything you’ve done for Soroptimist, including the significant changes you’ve helped SIA make over the past two years. And thank you for your dedicating to helping the women and girls we serve! Be the club people want to join. Extend the gift of membership extravagantly. Make a space for new members to contribute and celebrate your accomplishments. Ensure membership is joy-filled—and give us a sense of contribution and satisfaction with our results. Live the Dream of helping women and girls live theirs, each of us has to be an engaged member responsible for learning and growing, and being a positive change agent when necessary. 2018-2019 SIA President Elizabeth di Geronimo asked Soroptimists to focus on our Dream Programs. The Dream Programs are our best opportunity to unite all 21 countries and territories globally by enhancing our branding and recognition and helping us meet our Big Goal. Elizabeth introduced the following hashtag: #SpotlightSoroptimist and encourages clubs to use this hashtag on social media (Facebook, Twitter, Instagram, etc.) to show everything you do to support women and girls through our Dream Programs. For example, post updates on how your club is raising money for Dream Programs. Post a picture of a Live Your Dream Award recipient (if she is okay with it) meeting your club members. Post announcements about your Dream It, Be It program. Or post pictures from a Dream It, Be It event you support. And every time you do that, please include the hashtag: #SpotlightSoroptimist with your post. This helps us tell the world how much we are doing and lets other people join the conversation. It also helps us call on other activists around the world and mobilizes people around issues relevant to our members. Torrid, all three recipients were able to join us in Yokohama. Not only did Torrid cover the cost for them to fly from the United States, Mexico and Canada, they also provided each of the recipients with several outfits from the Torrid collection. The three brave and inspiring women shared their incredible stories of perseverance and had the opportunity to meet many of the Soroptimist members. Shamayel, of the United States, is originally from Afghanistan. She grew up in a city where the Taliban used violence and intimidation to prevent girls from attending school. After her parents died trying to help these girls, the U.S. government granted Shamayel immediate asylum to save her from being the next target. Once here, she was able to find local support to bring her siblings to the U.S. and serves as their caregiver while attending college full-time. Ana Caren, of Mexico, grew up in a home where physical abuse was the norm. Her parents suffered from mental illness and drug abuse, and Ana Caren was constantly moving between her family house and her grandparents’. Sometimes she had to beg on the street. That did not stop her from working toward her dream of finishing school. But when her mother died, Ana Caren’s dream was put on hold, as she became the caretaker for her three little brothers. This award represents a brighter future for Ana Caren and she can work toward her dream once again. Lucia, of Canada, endured many years of abuse. Her ex—the father of her children—was a drug addict who would stop at nothing to manipulate, brutalize and psychologically abuse her. Feeling worthless, useless and unworthy, Lucia did not see an end in sight. But she finally found the strength and courage to leave him and her life of abuse behind. Though she continues to struggle daily with post-traumatic stress, this single mother is determined to make a better life for herself and her two young children. Several clubs and regions were recognized for their for their tremendous efforts to advance SIA’s strategic plan. Congratulations to the following clubs and regions for a successful year and a job well-done!